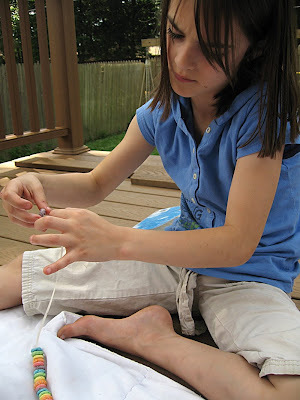 Yesterday, on another impossibly beautiful day, we made necklaces outside using a very thin ribbon that I dug out of my craft supplies and some brightly colored cereal O's. The girls exclaimed they had "SO MUCH FUN!" making the necklaces! 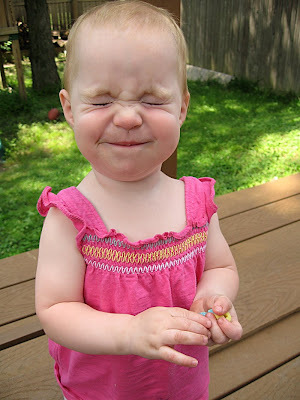 Behind Gracie's scrunched up face are cheeks full of O's. And then they proudly wore their cereal necklaces for about 10 minutes...before they were devoured! *If you haven't already, enter the giveaway from Ecostore USA to win 2 of their sustainably sourced plant and mineral based products! Great idea! So simple, yet so fun! Going to have to add this to next week's grocery list. Thanks! We always do these when we go camping - My 5 yr old daughter spend almost a whole hour making a lovely necklace a couple of weeks back only to have it eaten in less than 3 minutes! 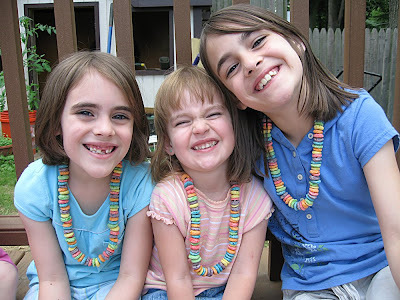 Making these necklaces is one of my fondest memories from my own childhood (possibly because it was the only time we were allowed to eat sugary cereal). Thanks for the comments! My girls thought it was a super treat because they aren't allowed sugary cereals either. 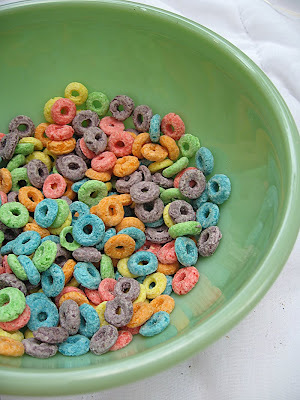 Lana almost fainted when she heard that some people eat those Fruity O's as breakfast! LOL!